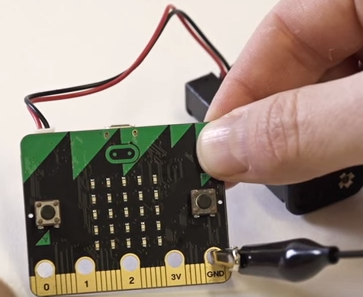 Build your own micro:bit piano using bananas! 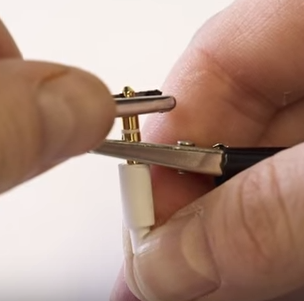 Have you ever tried making beat box sounds? 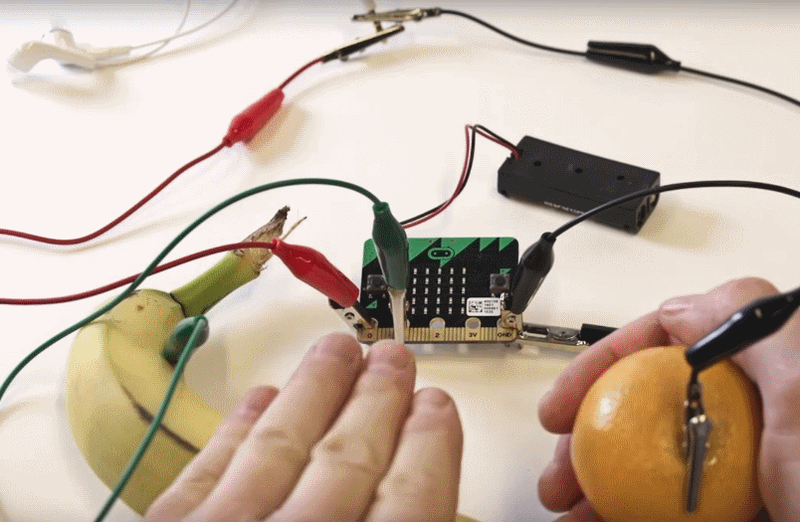 Let’s try making a beatbox with code and, yes, a banana! Start by adding a variable to store a musical note. Rename the variable to sound. Set the value of the variable to the note block Middle A from the Music drawer. 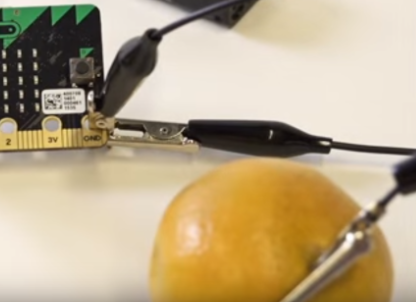 We want to play music when the fruit connected to a pin pressed. So, we register an event handler that executes whenever pin 1 is pressed. 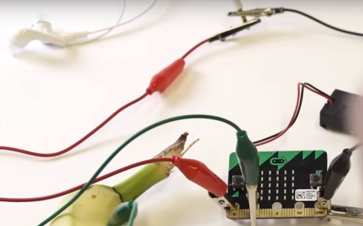 Pin 1 is, of course, connected to the banana. Add a on pin pressed block from the Input drawer. 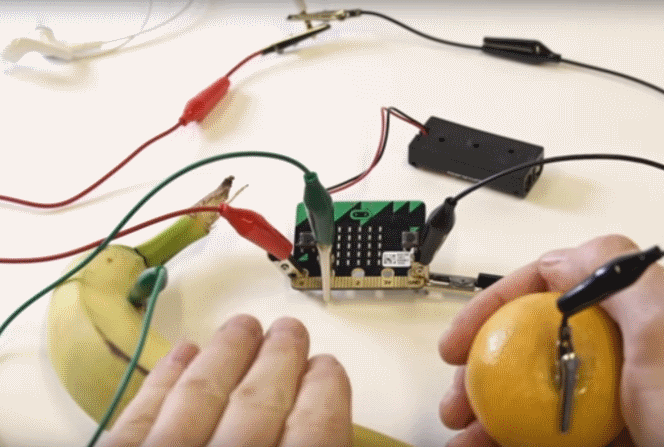 Now, let’s create some notes to play when the banana is pressed. 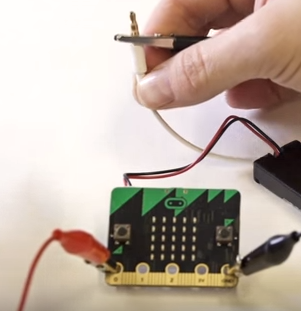 Click on the Loops drawer then insert a repeat loop into the on pin pressed block. Click on the Variables drawer and pull out a change item by block and put it into the loop. Rename the variable to sound. Change the value from 1 to 25. This will increase the variable sound from the note frequency of block Middle A to Middle A plus 25 and so on. Put a set to block for sound right after the loop. 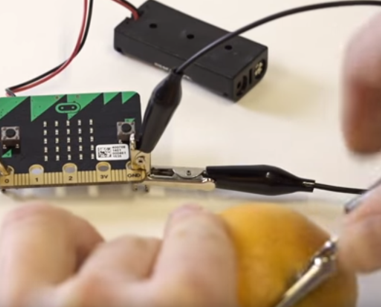 Set it to Middle A a in order to reset the sound after a banana press. Finally, insert a play tone above the change by. Pull out the sound variable block and drop it in the note slot of play tone. Change the beat fraction from 1 to 1/4. Click Download and try a banana press. Did you hear 4 notes play? 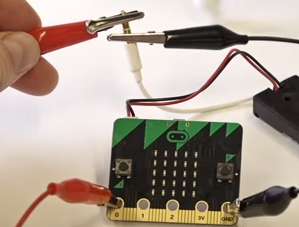 Go back to Make and repeat steps 7 and 8 with another banana but this time connect the crocodile clip to pin 3. Click Download again and play both bananas. It’s a fruit jam session!